Larry began by painting camper parts for Airstream in an old wooden building. After much work, his quality oriented, hardworking beginnings led to jobs for companies like Huffy, Shopsmith, Stanley, and Copeland, which resulted in a new and bigger facility in 1976. As PPF’s reputation for quality and craftsmanship grew, the company added on to its building in 1980—and again in 1989, 1997, and 2007. Over the years, Larry’s sons, Allen and Russ, took over the business and carried on the tradition of delivering quality products on time and at a fair price. PPF has become a leader in the liquid and powder coating industry. In addition to general commercial painting and powder coating, PPF has diversified and is known as one of the premier military specification paint houses in the nation (CARC). It is doing so by helping to complete mil spec CARC painting projects on armored vehicles and other components that protect our troops. Boasting 7 paint booths, 2,350 feet of conveyor, and a 12-stage stainless steel washer, our 100,000 square foot facility is wonderfully equipped to manage any powder coating or liquid coating project specifications. 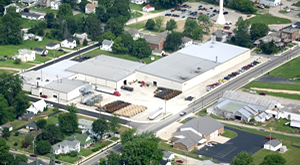 The location of our facilities, the equipment that we utilize, and the services we offer allow us to provide value and service to our customers. We apply liquid and powder coatings to many different surfaces with a variety of methods. This one-two punch – offering both powder and liquid coating services – is the formula that has allowed Production Paint Finishers, Inc. to partner with clients far and wide to satisfy parts coating needs. Being centrally located in Ohio also allows PPF the flexibility to deliver cost-effective services with the fastest possible lead times. Our two primary paint booths, Booths 1 and 2, are situated on the main, high production line. With over 1,300 feet of conveyor, this line features a stainless steel, 12-stage washer that allows us to zinc phosphate steel and trivalent chromium (Alodine 5900) aluminum. Excess water is removed in our dry off oven, and the parts are then painted using a variety of methods that have been detailed on this website. Curing for shipment is achieved in our bake oven, where we are able to paint thousands of high quality parts an hour on this line. The usual paints and powders used on this line are baking enamels, epoxies, urethanes, and polyesters. Paint Booth 4 is an air-dry booth designed for tray work. Unique parts that cannot be run on a conveyor for any reason are attended to here. Following a coating process of two-component polyurethane, parts are then cured in infrared ovens. Paint Booth 6 is a heavy component air-dry line that has 750 feet of 4-inch I-beam conveyor. Here we are able to handle large quantities of parts—up to 1000 pounds each. High build epoxies and two-component polyurethanes are commonly used on this line. Paint Booth 8 is a 16′ wide by 16′ tall by 40′ long, side down draft booth with force dry capabilities. Proudly providing powder coating and liquid coating paint services for your next project.